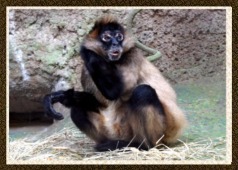 Attend a presentation featuring the zoo’s spider monkeys. Learn about our BEEP (Behavioral Enrichment and Enhancement Program) program meant to improve environments and animal care based on natural behaviors and instincts . Daily Presentations run Memorial Day thru Labor Day. Presentations will be held in front of the Spider Monkey exhibit located in the Tropics Building.